Remove the swingarm. Refer to “swingarm removal and installation” . Remove the swingarm pivot bearings (1) using the special tool. 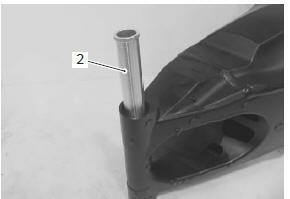 Remove the center spacer (2). 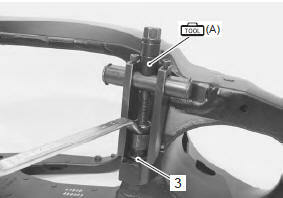 Remove the cushion lever bearing (3) using the special tool. 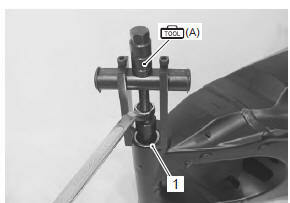 Press the pivot bearings into the swingarm pivot to the depth “a” of 0 – 0.5 Mm (0 – 0.02 In) from the edge with the special tool and suitable size socket wrench. when installing the bearing, stamped mark on the bearing must face outside and apply a small quantity of the grease to housing. 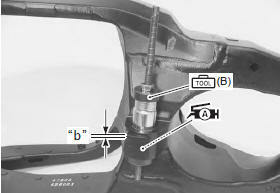 Press the cushion lever bearing into the swingarm to the depth “b” of 1.5 Mm (0.06 In) from the edge with the special tool and suitable size socket wrench. apply a small quantity of the grease to housing when installing the bearing. Install the swingarm. 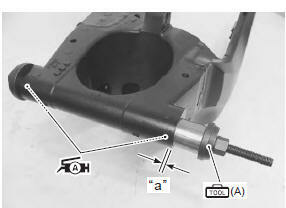 Refer to “swingarm removal and installation” .